While ur family of six used to be able to eat quite a bit of produce, our produce consumptoin has increased quite a bit since we have been trying to deal with food allergies. I’ve been trying to manage where to keep all of it in our small kitchen. Our fridge is full of food. Counter space is limited. 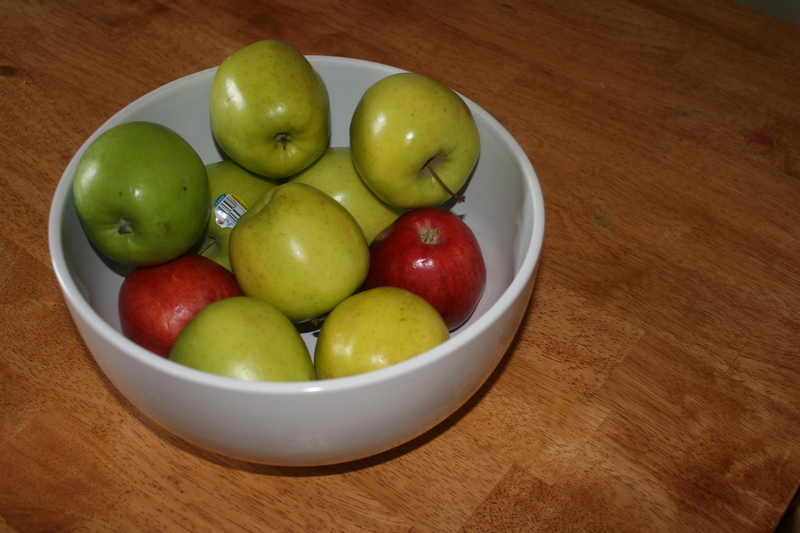 I’ve been shuffling bowls of fruit around the kitchen and was rather tired of it. Then I came up with the plan to install floating shelves in our kitchen with lovely white bowls to contain some of our produce. I’ve been keeping an eye out for affordably price white bowls. This was my first purchase. It’s lovely and deep and looks wondeful with produce in it. I was surprised when I got it home jst how much it can actually hold. As the weather warms and we build the shelves, I need to gather some more white bowls. Had you considered one of those hanging mesh baskets? They usually have 3 baskets and they’re perfect for fruits & veggies. I had. When I read reviews, most of the ones on the market now appear not to handle the weight of much produce. Plus with my kids, I think a shelf with bowls is going to work out better.